It appears Capcom's senior vice-president Christian Svensson has left some evidence in the Capcom Unity forums. In a small post he declared that more news on Ace Attorney 5 will be coming soon. We'll have new AA5 news in the not so distant future to share though. We did confirm it was coming Westward back at [Tokyo Game Show]. An interesting clue from Capcom, we wonder what the news will bring. A release date would be very nice indeed. The last time we saw a game from the Ace Attorney series in the West was in 2010 with Ace Attorney Investigations: Miles Edgeworth, and we haven't seen Phoenix Wright as the main protagonist since Phoenix Wright: Ace Attorney Trials and Tribulations. While the West has been deprived of the spiky-haired lawyer, he's been teaming up with another gaming icon in Japan in Professor Layton vs Ace Attorney. We've still not heard anything on the localisation of that one. 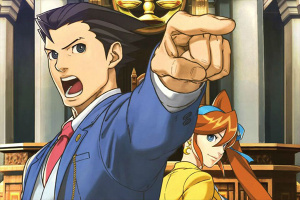 Are you looking forward to more courtroom drama with Ace Attorney 5? Let us know in the comments section below. There's no reason for LaytonXWright not to come out here, surely it's going to sell to both Ace Attorney and Layton fans? This is game number 5 already? o_O I still have to play 2 to 4! Never played ace attorney. Looking to start with this. If both Ace attorney 5 and Professor Layton vs. Phoenix Wright were to be released this year, my wallet will be in a lot of pain. "Sorry, but the higher ups changed their minds, so AA5 is cancelled. As for PL vs. AA, we currently have no plans to bring it out of Japan." ^Wouldn't be surprised if this happened. I have heard plenty of good things about the AA series but I was looking to start with AA5. @sir_Anthony The franchise did start about a full decade ago. @sir_Anthony - Don't worry; I'm in the same boat. I've only played the first one on WiiWare. That said, I'm more looking forward for Layton x Ace Attorney, though I haven't yet played any Layton games. Just a reminder, the first three games are available for cheap on WiiWare. Damn it all, I enjoyed Miles Edgeworth Investigation more than any game of the main series. Y u no give us Edgy 2, Capcom? SOOOOOOO EXCITED! Ace Attorney is the best series of video games ever! I have already been deprived of one so Professor Layton vs. Ace Attorney must be localised! Ace Attorney 5 looks amazing too! Man this is what I've been waitin for! The popularity of Layton in all markets worldwide defeats any excuse why this should not be localised. I'm excited as can be. Don't start with number 2, whilst the last case is one of the series greatest the game is shorter and more filler-ish than the others. Been playing Trials and Tribulations all day such an improvement! Which is 4, Apollo or Edgeworth's game? The fourth main game is Apollo Justice, Miles Edgeworths series is sort-of like a sub-series of Ace Attorney called Ace Attorney: Investigations. Anyway, If you haven't tried this game, I recommend you to play the first trilogy... When you do it, you'll know why this game is so amazing. You can skip the other games... which ruined the series. This game is a must get for all 3DS owners, as long as you have the attention span for a visual novel. CANNOT WAIT. MUST GET IT. I need to play 3 and 4 still, but I need this ;_; and also Layton vs., of course. CAPCOM PLS. Don't start with this one. Shu Takumi, the creator of the series is not involved in this one, just like with the two Investigations games. Or in other words, it'll be crap. Until now the AceAttorney serie never dissapointed me, so I really can't wait AA5!!! Good to hear that it's still coming to the west. I would be really happy if they confirm Professor Layton vs Ace Attorney though. I will cry salty, salty tears if Capcom changes their minds about bringing AA5 over. Still kinda bummed that the crossover game with Layton is not released outside of Japan. Also, I still want Miles Edgeworth 2. At least Ace Attromey 5 will be coming. I loved Ace Attorney 1 through 3. 4 sucked until the end imo & Ace Attorney Investigations was awesome (I still want the 2nd one). I will buy Ace Attorney 5 as a matter of keeping up with the series continuity but I hope it doesn't blow as badly as 4 did. The DS ones go for a ridiculous amount here, I was hoping the 3DS counterpart would be a bit more accessible. Put it all on wiiware again ill download it as usual ! I played the first games on the Wii when they were released as Wiiware. I was instantly in love. I've been throwing my money at my 3DS for a while now, but so far AA5 hasn't shown up!